From the church, walk past Hotel Sanvì to the Ustì Vedl farmstead, where the trail descends to cross the stream and continues on its left side to the Da Porta farmstead and the hamlet Ties. Leaving Ties behind, walk through the woods and pastures to the abandoned hamlet Plan, where the trail turns left and continues uphill to the hamlet Laguscel. Just behind the Laguscel farmstead, turn right to walk to the hamlet of Vì. 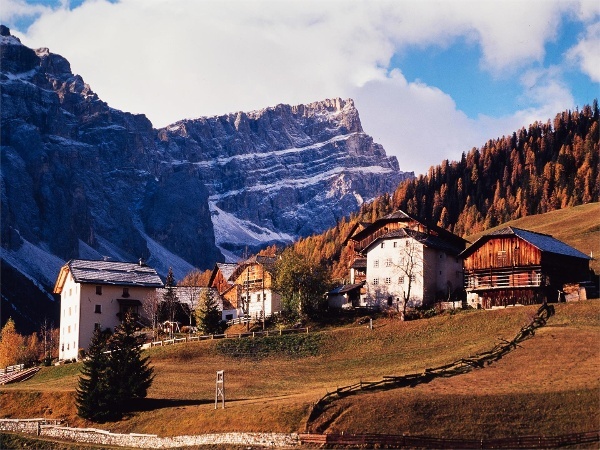 From Vì, walk past the Jachin farmstead to the hamlets Costa and Grones and on towards Frëina. A small trail runs through the meadows to the hamlets Seres and Miscì which are located just outside the Val di Murins valley with its fascinating lime kiln. From there, a the street runs back to Lungiarü. Take Bressanone North - Val Pusteria highway exit, continue via San Lorenzo, into Val Badia to San Martin de Tor. Pass the village and continue to Lungiarü.